Listening: Um, yes, I'm spoiled. I'm sitting here at my computer being lazy (well, not sure if writing blog posts is exactly being lazy...but it feels like it sometimes) and my husband is doing the laundry and cleaning the house. I'll probably help him later though... But, yes, he's the best! Loving: I took my class to THREE stores yesterday for our monthly community trip and it was a huge success. Stay tuned for a blog post on that soon. Thinking: Yeah, Super Bowl plans, don't really have any yet so just thinking about what we might end up doing :) I'm not a huge football fan, but I do enjoy watching the game and eating food. Plus, I'm doing squares with some co-workers, so it's exciting to see if I'll win anything! 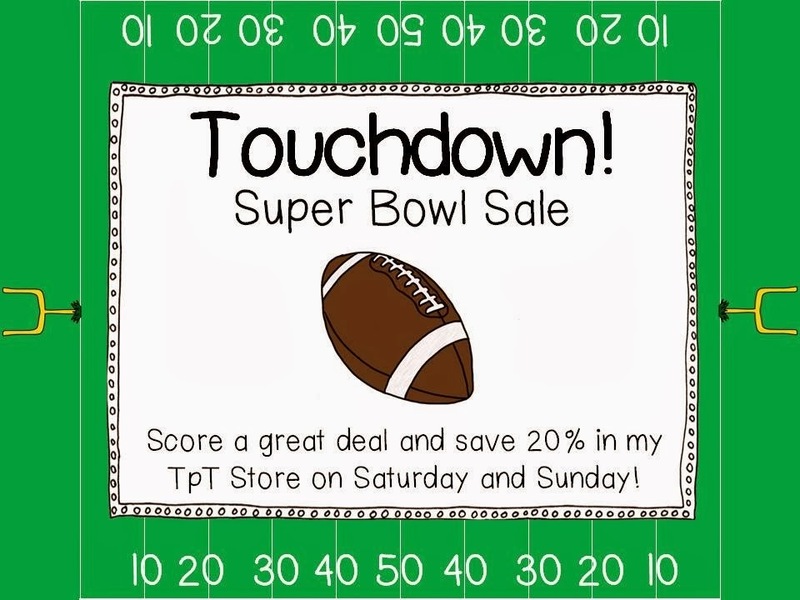 One thing I am loving about this Super Bowl Sunday is the teachers pay teachers sales! There isn't a sitewide sale this year, but plenty of stores (including me) have their stores for 20% off! Wanting: Holy snow this year! It's beautiful and I do love it. I am just so over shoveling, especially when it's this heavy, thick stuff. 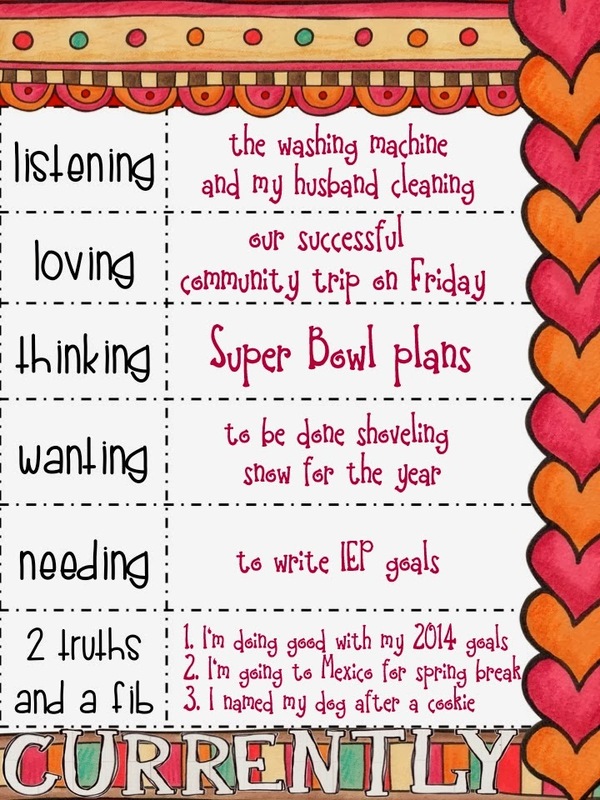 Needing: IEP goals...I put them off. I have an IEP on Tuesday and one the next week and I can't decide what I want to write for goals. Too many options, too much pressure! 2 Truths and a Fib: Okay, this was really hard! I'm not a good liar. Could you tell my fib right away? 1) Doing good on my 2014 goals - TRUE! I have been planning a few meals a week (this just means I know what I'm going to make before I get home, nothing too elaborate usually, but so helpful to have somewhat of a plan in mind). I have posted 6 blog posts in January (goal was at least 5). Added 8 products to my store (goal is 5 a month). Better communication with my aide staff - I have set up individual 5-15 minute meetings that will happen every other week and it's off to a good start! Also, communicating with my aides has led to better data collection. 3) Named my dog after a cookie - TRUE! Yup, her name is Oreo and she's a cutie. Oh, how I feel your IEP pressure! I have I need to write by Wednesday for a new kiddo (as in new to special ed., fresh from RTI). It is such an overwhelming process. I'm glad that the IEP writer program my district uses lets us create goal banks. Each student's goals are different, but they are often similar in nature. That save me a ton of time! I'm looking forward to reading about your shopping trips! You are so lucky that your husband does those things! Yay! I didn't guess your lie! I would have guessed the lie was doing good on goals. I made too many goals this year and I am having a hard time! Have a great February! Good for you and keeping up with your goal! That's fabulous!